B sent us an email since last year to ask us became their wedding photographers for an intimate wedding in this April 2018. They are both lawyer living & working in New York but they want to celebrate their big day in Nha Trang because this place is B father's hometown. The ceremony has taken place at a Gothic Cathedral in Nha Trang. "The parish was founded in 1886 by French missionaries. The present church was built in Gothic Revival style in 1928 as a parish, depending on the Apostolic Vicariate of Quihnon. It was consecrated on Easter 1930 under the title of "Christ the King"." Christ the King Cathedral is definitely one of the best places for a ceremony and one of our favorite Church so far by its beautiful design, architecture built by French during the Việt Nam War. We mean obsession! Last but not least, a cruise for chasing sunset is ready for their dinner reception after that. 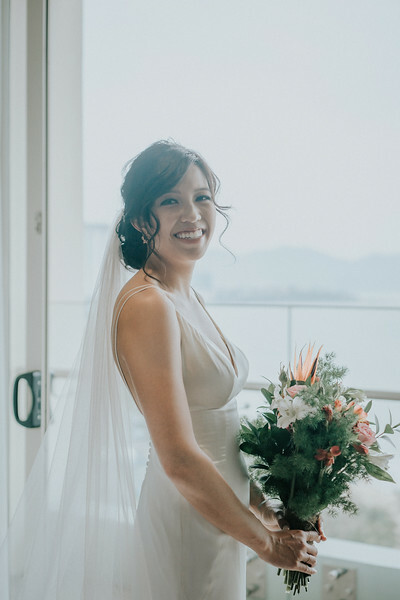 An intimate wedding celebrated in Nha Trang, B&M travel far away from America back to Viet Nam, celebrated their wedding, church ceremony at Nhà Thờ Đá Nha Trang.